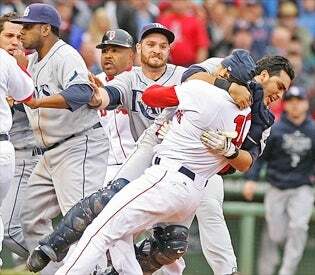 The Boston Red Sox and Tampa Bay Rays are spirited combatants on the field, and after the most recent Coco Crisp/James Shields donnybrook, tensions are running extremely high going into this series. But, this time around, the Sox have much more to worry about than a Scott Kazmir fastball to the ear hole. According to the Boston Herald, an anonymous Memphis-based Sox hater has mailed several death threats to some of the “black and Latin players” on the Red Sox, which has team members seriously spooked. Right now authorities are doing everything they can to keep the players safe — extra security has been called in and some players will get escorts to and from the stadium —but there's been no progress in tracking down the author of the letters. Hopefully all the white guys on the Red Sox don't feel left out by the extra attention their teammates are getting. That would be bad for chemistry.